i just wanted to thank everyone for the phenomenal response i’ve gotten from this month’s giveaway (especially you money saving maine-iac!). anyway, i thought it might be nice to do a follow up post that’s less about my story and more about what i learned during my year of change hunting. like a “how to” for aspiring hoarders. 1. parking meters. people in a hurry are always dropping change in the hunt for quarters. portland is especially great for this. 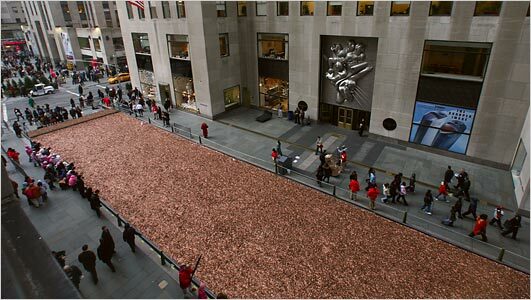 plus, pennies blend into the bricks on the sidewalk. 2. in front of cash registers. basically, anywhere that people take money out, they’re likely to drop it. 3. couch cushions. i’ve had the best luck at bars & restaurants that have upholstered furniture and lots of traffic. once i found $3 in quarters in a wingback chair at a hotel bar. score! 4. in & around vending machines. the cardinal thing to remember here is that people are fundamentally lazy, and if it’s less than a quarter and requires bending at the waist to pick up, they’re leaving it behind. it’s your job to capitalize on this. 5. parking lots. when people are digging into their pockets to get their car keys, their loose bills and change are trying to escape. i found $4 in the CVS parking lot, and $1 at the st. john st. strip mall. it can happen to you. 1. get yourself a sweet container that you can enjoy watching fill up. you don’t want your street change to mingle with your common pocket change (scandalous!). plus, it’s the best way to gauge your progress. 2. carry hand sanitizer. the hazard of picking up things off the ground is that they’re generally pretty unsanitary. i’m not particularly squeamish, but there was that time i picked up a handful of change that turned out to be covered in tiny green bugs. plus there’s always the surprise “sticky penny”. proceed with caution. 3. don’t be self conscious! nobody is paying attention. and even if they are, they’re probably just jealous that you saw that nickel first. 4. watch where you’re going! a lot of looking at the ground, means a lot of not looking in front of you. the world is filled with telephone poles and pedestrians. look out! 5. change walking is great exercise. when it’s not -10 wind chill, i spend most of my lunch breaks spiraling around the city streets on the change hunt. the more time you spend out on the street, the more change you’re likely to pick up. plus, i hear that exercise is good for you or something. My best find was during my ONE AND ONLY garage sale in my entire life. Half-way through the horribly long and depressing day, I found a wad of cash at the curb in front of my house. It was over $80, and I felt horrible that someone had lost their garage-saling dough. I held it all day, hoping they would return (and correctly identify their cash… LOL) but they never did. let me assure you that i have been picking up filthy pennies for a year now, and i haven’t gotten so much as a cold. (that bout of the stomach flu can definitely be traced to a girl in my dance class). however, the hand sanitizer does help. that is an AMAZING dropped money story! i’ve never found more than a $20, but i’ve found several- so i’m not complaining. the best story i’ve ever heard was from a local mail man who found a twenty on the ground… and then found another… and another. apparently, someone had forgotten to take their cash out of an ATM, and it just blew down the street. Also, one of my best friends found a $50 on the ground in front of the order counter at arby’s. who uses $50s at ARBY’S? Even more curious – who the hell forgets their cash at an atm? I mean, isn’t that what you’re there for – to get some cash? clearly, you underestimate the amount of drunk people in my area. I guess so. One would have to be really schnockered to walk away from their money, though. again. you underestimate my hometown drunks. check this out. Oh, wow! On the bright side – I counted way over 10 people – you could invite them to your sandwich thin party! good idea. you think they seem like the “sandwich thins” crowd?